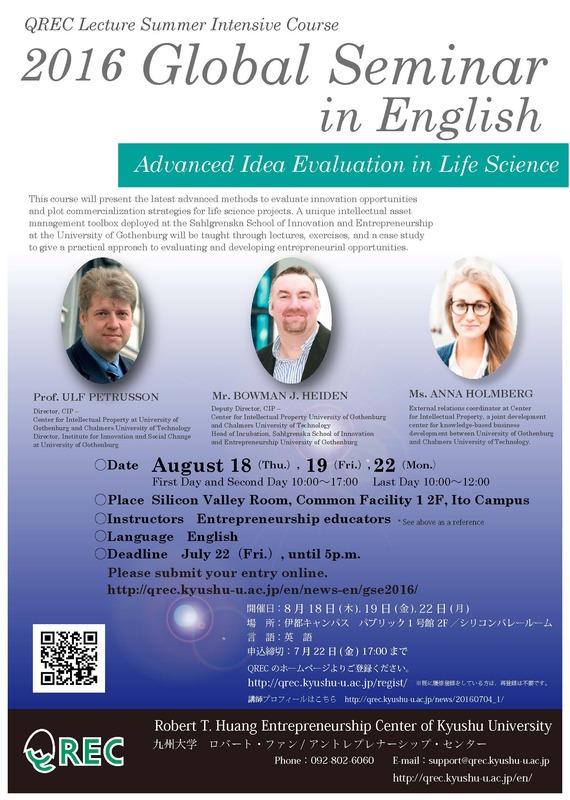 This course will present the latest advanced methods to evaluate innovation opportunities and plot commercialization strategies for life science projects. A unique intellectual asset management toolbox deployed at the Sahlgrenska School of Innovation and Entrepreneurship at the University of Gothenburg will be taught through lectures, exercises, and a case study to give a practical approach to evaluating and developing entrepreneurial opportunities. Reference Books：Lecturer will show some books. Study Consultation (Office Hour)：Appointment is necessary. Ulf Petrusson is a Professor of Law at the University of Gothenburg as well as the Director at the Institute for Innovation and Social Change at the School of Business, Economics and Law, University of Gothenburg. In addition, Professor Petrusson is the director for the Center for Intellectual Property (CIP) and Program Director at the Intellectual Capital Management (ICM) program at Chalmers University of Technology and University of Gothenburg and has been responsible for the development of several entrepreneurship educations across multiple faculties, including engineering, law, medicine, and business. He also holds the position as Professor II at the Norwegian University of Science and Technology. Professor Petrusson is engaged in research focused on law and technology with specific interest in how technology and other knowledge can be claimed and managed as assets, property, and capital at the interface of research and innovation for both industry and universities. Professor Petrusson has experience in working as a Company Lawyer/IP consultant at Göteborgs Patentbyrå AB. He is a co-founder, senior advisor at CIP Professional Services Ltd, a development and business consultancy company. He is a member of several boards including the Swedish Patent and Registration Office. Professor Petrusson is also co-founder, senior advisor and board member at CIP Professional Services Ltd, a development and business consultancy company. Managing Intellectual Property Magazine has twice chosen Professor Petrusson as one of the 50 most influence persons in the world of IP. for knowledge-based business development between University of Gothenburg and Chalmers University of Technology. In addition he directs the incubation activities at the Sahlgrenska School of Innovation and Entrepreneurship. Previously he was Innovation Director for the Qatar Science & Technology Park, where he was responsible for driving innovation strategy and intellectual property policy. and his research is in the field of intellectual property and open innovation in knowledge-intensive sectors with a particular focus on ICT standards and policy. Mr. Heiden currently resides in Göteborg Sweden with his wife and two children. Before turning his focus to the field of knowledge-based business, he played professional basketball in a number of European countries. Anna Holmberg is the External relations coordinator at Center for Intellectual Property, a joint development center for knowledge-based business development between University of Gothenburg and Chalmers University of Technology. She is a project manager and lecturer at Sahlgrenska School of Innovation and Entrepreneurship and Chalmers School of Entrepreneurship. She has worked for the Institute of Innovation and Social Change at University of Gothenburg and has previous experience from business law firms, where she focused primarily on intellectual property and mergers and acquisitions. Ms. Holmberg is also actively engaged in the Royal Swedish Academy of Engineering Sciences. She holds a Masters of Laws and a Masters of Medicine with focus on Business Creation and Entrepreneurship in Biomedicine from the School of Economics, Business and Law and Sahlgrenska Academy at University of Gothenburg.